(Nanowerk News) Researchers at the University of Pennsylvania, the University of Wisconsin-Madison and IBM Research-Zürich have fabricated an ultra sharp, diamond-like carbon tip possessing such high strength that it is 3,000 times more wear-resistant at the nanoscale than silicon. Also see our Nanowerk Spotlight article on this research: Achieving ultralow nanoscale wear of one atom per micrometer. 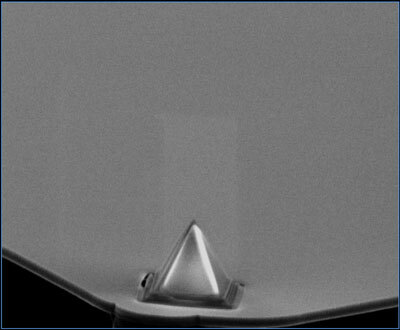 This is an SEM image of a silicon microcantilever with an ultrasharp tip of diamond-like carbon with silicon. The importance of the discovery lies not just in its size and resistance to wear but also in the hard substrate against which it was shown to perform well when in sliding contact: silicon dioxide. Because silicon –- used in almost all integrated circuit devices –- oxidizes in atmosphere forming a thin layer of its oxide, this system is the most relevant for nanolithography, nanometrology and nanomanufacturing applications. Probe-based technologies are expected to play a dominant role in many such technologies; however, poor wear performance of many materials when slid against silicon oxide, including silicon oxide itself, has severely limited usefulness to the laboratory. Researchers built the material from the ground up, rather than coating a nanoscale tip with wear-resistant materials. The collaboration used a molding technique to fabricate monolithic tips on standard silicon microcantilevers. A bulk processing technique that has the potential to scale up for commercial manufacturing is available. "It is not clear that materials that are wear-resistant at the macroscale exhibit the same property at the nanoscale," lead author Harish Bhaskaran, who was a postdoctoral research at IBM during the study, said. The study, published in the current edition of the journal Nature Nanotechnology, was conducted collaboratively by Carpick and postdoctoral researcher Papot Jaroenapibal of the Department of Mechanical Engineering and Applied Mechanics in Penn's School of Engineering and Applied Science; Bhaskaran, Bernd Gotsmann, Abu Sebastian, Ute Drechsler, Mark A. Lantz and Michel Despont of IBM Research-Zürich; and Yun Chen and Kumar Sridharan of the University of Wisconsin. Jaroenapibal currently works at Khon Kaen University in Thailand, and Bhaskaran currently works at Yale University.